Sure, you could go buy one of those commercially-grown, genetically modified books in a big box store. Or, you could sample one of these fine, artisanal, 100% certified organic selections, each hand-crafted by our very own free-range authors. Really, is there even a choice here? If you’re an EFF member, you’re probably already a fan of one (or more) of the fantasy books below. If not… well, you’re in for a treat. He betrayed everything to save his wife. and still, the poison rages through her body. His last chance to save her lies in an ancient Wellstone, a repository of power buried and lost long ago. Luck—or something more troubling—leads him to a small group searching for the same stone. A disgruntled dwarf, a befuddled wizard, and an elf with an unsettling amount of power. With their help, he might just find the cure before time runs out. JA Andrews lives near the Rocky Mountains of Montana with her husband and three children. She is eternally grateful to CS Lewis for showing her the luminous world of Narnia. She wishes Jane Austen had lived 200 years later so they could be pen pals. She is furious at JK Rowling for introducing her to house elves, then not providing her a way to actually employ one. And she is constantly jealous of her future-self who, she is sure, has everything figured out. Angela J. Ford is an award-winning blogger and author of the international best selling epic fantasy series: The Four Worlds. She enjoys traveling, hiking and can often be found with her nose in a book. If you happen to be in Nashville, you’ll most likely find her at a local coffee shop, enjoying a white chocolate mocha and furiously working on her next book. Low-caste sailor and Salt witch Kinneret Raza can’t take it anymore. The man she loves is engaged to a horrible woman of his rank. Both she and her sister are slowly starving to death. So when she hears about a treasure hidden under cursed water, she leaps at the chance to fix everything. But when a madman captures her sister, she must change course. Only the forbidden magic her mother taught her can push the odds in her favor. She may go down, but by the seas, she’ll go down fighting. USA Today bestselling author Alisha Klapheke travels the world, teaches martial arts, and writes stories inspired by history and myth. Unless it’s Friday afternoon. Then she is probably napping. A forgotten prison. A powerful artifact. A world teetering on the edge of destruction. 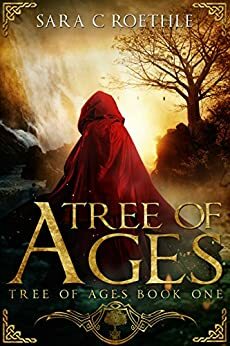 Ignoring the warnings of his oldest friend, Wulf Rome removes the ancient, mysterious axe he finds embedded in a wall in a cavern deep underground. The axe’s shocking power wins him the throne, but removing it cracks a prison built millennia ago. A prison built by the gods to hold Melekath, the one all of them fear. Now Melekath reaches into the world once again. Unfettered, his three nightmarish Guardians spread havoc across the land. Plagues and monsters appear in their wake. In the midst of the chaos, an enigmatic stranger appears. He claims to be immortal. He claims that only he can save the world. There is something sinister about him, and the weapons he offers are dangerous and perhaps uncontrollable, but with the apocalypse looming, what other choice does Wulf Rome have? Long ago, I grew up on a working cattle ranch in the Arizona desert. But if you’re thinking that sounds romantic…no. Just no. Replace those thoughts of 10-gallon hats and six-shooters with old, rusted trucks, sagging, barbed-wire fences, sway-backed horses and unending work. Which probably has a lot to do with why I became a writer. It involves a whole lot more sitting than ranching does, though most of the time the pay has been about the same. I’ve been writing novels for 30 years and some might even be worth reading. Kole Reyna is one of the last Embers. When an ancient foe returns to terrorize his valley home, he must discover the limits of his power. He must embrace the legacy of the flame. Steven is a fighter turned writer who resides in the Boston area. A former sports and entertainment writer, his work has been featured on ESPN.com, LA Weekly and other known outlets. He wishes all disputes were still settled with a friendly game of hand-to-hand combat, is a fan of awesome things, and tries to write books he’d want to read. He hopes you like them. Only a naïve girl with the perfect voice can rediscover the lost magic of Dragon Songs. Only the Black Lotus Clan can prevent her from unleashing it. JC Kang’s unhealthy obsession with Fantasy and Sci-Fi began at an early age when his brother introduced him to The Chronicles of Narnia, Star Trek, and Star Wars. As an adult, he combines his geek roots with his professional experiences as a Chinese Medicine doctor, martial arts instructor, and technical writer to pen epic fantasy stories. Darien Lauchlin has already lost everything. Now the only thing he has left to lose is his soul. M.L. Spencer loves fantasy, especially favorite authors Robert Jordan, Patrick Rothfuss, George R.R. Martin, David Eddings, Neil Gaiman, Joe Ambercrombie, and Terry Goodkind. 2012 IndieReader Discovery Award for Fantasy. A crumbling magical world. The darkest of wizards. A company of unlikely heroes. A quest for the ages. The mighty volcano Fang awakens. Smoke from unexplained and spontaneous fires foretell an unknown doom. As the very world begins to shudder and quake, the dark and powerful wizard Sartean D'Avers plots to enslave the people of Mor, depose its fool king, ascend the throne and secure unfettered control over the lands of Greater Tahr. The lives of four young citizens of Tahr are uprooted as omens of impending perils emerge throughout their enchanted land. Lucan Thorne: a swashbuckling tavern hustler. Aria Evanti: a demure elven princess. Firstson J'arn Silverstone: stoic heir to the dwarven Sovereign. Shyla Greykin: an insatiably curious and delightfully irreverent gnome girl. Drawn together by forces unseen, these four find their futures inextricably entangled as an epic quest takes shape in this breathtaking first installment of The Days of Ash and Fury. Sean Hinn is the author of "The Days of Ash and Fury," an Epic Fantasy series. Sean is owned by three incorrigible dogs, a loving wife, and three amazing children (adjectives interchangeable). An avid guitarist and classical music lover, Sean has been writing stories and creating original music since before Guns N' Roses posed the existential question, "You know where you are?" Not wishing to die, Sean currently lives in Fort Worth, Texas - nowhere near any jungles. Finn doesn't remember much about her previous life, and in a world that has been changed by the wars of the Tuatha De, where trust is hard to come by, answers are even more difficult to find. Little does Finn know, an unknown evil tugs on the strings of fate, and the answers she so desperately seeks may be more important than she could have ever imagined.